Hort Flower & Vegetable Show today, Aug. 8, from 2-4 p.m. 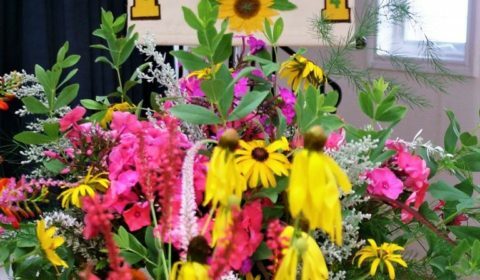 Celebrate 70 years of the beautifying Gravenhurst this afternoon at the Seniors Centre for their annual flower and vegetable show from 2-4 p.m.
GRAVENHURST — Hot weather this summer has been a boon — er bloom — for gardeners. As long as they watered. The proof is in the 70th annual Gravenhurst Horticultural Society Flower and Vegetable Show today, Aug. 8, at the Gravenhurst Seniors’ Centre. Dozens and dozens of flowers and vegetables, each treated lovingly with TLC (water! ), are on display. The judge had the morning to peruse the perennials and pansies and award the coveted red, blue, yellow and white ribbons to the dozens of society entrants. And this being the sapphire anniversary of the society — which first began beautifying Gravenhurst in 1924 — there is an impressive display of its history. Society treasurer/PR person Lois Cooper combed the Gravenhurst Library’s newspaper files and unearthed a ton of information buried within, which she has compiled and put onto a half-dozen large display boards. It chronicles much of the town’s history the past century. All of this is open to the public today from 2-4 p.m.
Come — get out of the rain — judge for yourself.